METHODS: Motor coordination, visual-motor integration and academic achievement were assessed using the Movement Assessment Battery for Children-2, the Beery-Buktenica Developmental Test of Visual-Motor Integration-4, and national and mid-year assesments respectively. Spearman Rank order correlations and stepwise regression analyses were used to respectively determine significant associations and unique contributors. Developmental coordination disorder (DCD) is characterised by deficits in the acquisition and execution of motor skills that can be identified at a young age and which has a negative impact on academic achievement and everyday activities (American Psychiatric Association [APA], 2013). DCD can only be diagnosed in the absence of any other neurological or intellectual disabilities (APA 2013). DCD is reported in 5% - 6% of 5- to 11-year-old children (APA 2013), with boys more likely than girls to have this condition (Asonitou et al. 2012; Lingam et al. 2009). Children with DCD's visual-motor perception and spatial orientation are described as inhibited and their ability to make quick motor adjustments are hence affected (APA 2013). Purcell et al. (2012:304) are of the opinion that the ability of children with DCD to process movement demands is influenced by poor visual-motor integration skills. Well-planned, coordinated and conscious movement can only take place when strength control is applied correctly, when motor planning occurs in fine detail and when continuous adjustments are made correctly by the neurological feedback system (Botha 2013). Clarification of different subsystems, including sensory and perceptual systems that contribute to general coordination, development of motor coordination and motor coordination difficulties is therefore of importance when assessing DCD (Cermak & Larkin 2002). A variety of test components can be required to approach the general construct of coordination, including tasks measuring neurodevelopmental function, tasks classified on the basis of interaction with the environment and fine and gross motor tasks (Cermak & Larkin 2002). Researchers (Dwyer, Baur & Hardy 2009; Riethmuller, Jones & Okely 2009) highlight in this regard that many body systems, including sensory, musculoskeletal and neurological systems are being incorporated during a child's motor skill development and are therefore different but important underlying constructs of coordinated performance in children. Relationships between DCD and visual-motor integration skills (Bonifacci 2004; Cheng et al. 2014; Tsai, Wilson & Wu 2008), and between academic achievement and visual-motor integration skills are also reported (Goldstand et al. 2005; Kulp 1999; Pieters et al. 2012; Van Hartingsveldt et al. 2014). The findings reported by Alloway and Temple (2007:483) indicate that children with DCD display deficiencies with regard to working memory; thus implying that these children's literacy and numeracy skills will be influenced negatively. Children with DCD have poor executive functioning abilities (Zhu, Tang & Shi 2012) which can negatively impact their motor development (Leonard et al. 2015; Schurink et al. 2012) and academic achievement (Thorell et al. 2013). Handwriting speed depends on the maturity of visual-motor integration as well as visual information processing and memory (Tseng & Chow 2000). The mastering of visual-motor abilities (Memisevic & Sinanovic 2013), visual working memory (Lepach, Pauls & Petermann 2015) and motor skills (Schurink et al. 2012:730) relies on effective executive functioning. This study was based on a cross-sectional cohort that was part of a stratified and randomised longitudinal study design (NW-Child Health, Integrated with Learning and Development), which covered a period of 6 years (2010-2016). The North-West Child Health, Integrated with learning and Development (NW-CHILD) study included baseline measurements and two follow-up test opportunities during this period (2013-2016). In order to determine the sample for the baseline measurements in 2010, a list of schools in the North West Province was obtained from the Department of Basic Education (DoBE), where after stratification was done according to school regions and school types (quintile 1-5). A list of schools in the North West Province, which were grouped into eight education districts that each represented 12-22 regions, each with approximately (minimum 12, maximum 47), were used. Four regions and were then randomly selected with regard to population density and school status. Within each region, five schools were selected where each of these schools represented the particular quintiles (Quintile 1 - schools in poor economic areas to Quintile 5 - schools in good economic areas). The DoBE in each province used a poverty classification to classify schools in different quintiles. This poverty classification was obtained from the National Census data which included income, dependant ratios and levels of literacy (Pauw 2005). Quintile 1-3 schools represented children from low socio-economic environments where Quintile 1 and 2 schools are released from paying school fees, while Quintile 4-5 schools represented learners from higher socio-economic schools (Pauw 2005). The MABC-2 is a test battery that focuses on the identification of impaired motor function in children between the ages of 3 and 16 (Henderson, Sugden & Barnett 2007). This measurement instrument applies to three age groups, namely 3- to 6-year-olds, 7- to 10-year-olds and 11- to 16-year-olds. For the purposes of this study, only the tests applicable to the age band that includes 7- to 10-year-old age children were used. Within each age group, eight sub-items were divided into the following three coordination subsections: manual dexterity, aiming-and-catching and balance. The manual dexterity subtest consisted of three sub-items, while there were two aiming-and-catching sub-items and three balance sub-items. Each activity was demonstrated by the test recorder prior to a trial effort and two formal test efforts. The second test effort was only executed if the participant failed the first attempt or if the activity was not executed within the specific time limit set for his or her age group on the record form. It took between 20 and 40 min to complete the test. Each sub-item's raw score was converted to an item standard score. These item standard scores were then added up to obtain an overall standard score and percentile for each subdivision. Finally, the total test score (sum of all eight items' standard scores) was converted to an overall standard score and percentile. A higher standard score indicated a better overall performance. The overall test percentile was categorised according to different DCD statuses. Participants with percentiles at or below five or between the 5th and 16th percentile were grouped into the moderate- to severe-DCD group. Any values at or above the 16th percentile placed a participant in the typical or without-DCD category. The total test scores that classified participants in different DCD categories were as follows: a test score of less than or equal 67 indicated moderate to severe-DCD, while a score of more than 67 placed the participant in the typical or without-DCD category. The MABC-2 is a valid test to reliably identify children with and without motor deficits. Reported validity values ranged between r = 0.84 (Tan, Parker & Larkin 2001) and r = 0.6 to r = 0.9 (Croce, Horvat & McCarthy 2001). The Beery-Buktenica Developmental Test of Visual-Motor Integration, 4th edition (VMI-4), is a measurement instrument that assesses visual-motor integration skills and consists of two additional subtests, namely visual perception and motor coordination (Beery & Buktenica 1997). The two additional tests focus on visual perception and motor coordination where the latter shave a particular focus on hand control. The purpose of the VMI-4 is the early identification of children with impaired visual-motor integration (VMI) as well as determining the extent to which an individual's visual and motor abilities can be integrated. The extent of the concurrence between visual perception and fine motor movement is included in this measuring instrument. Poor results in the VMI-4 can be ascribed to the inability to integrate visual-perceptual (VP) and motor skills and not necessarily to insufficient skills. The VMI-4 is a reliable test battery with a validity of r = 0.92, r = 0.91 and r = 0.89. The VMI test consisted of drawing three trial shapes and 24 increasingly complex geometric shapes. Each participant was expected to draw a geometric shape with a pencil (without using an eraser) and only one attempt per shape was allowed. This test had to be completed within the set time or was stopped after three consecutive mistakes. It took approximately 10-15 min to complete and could be executed individually or in a group. The visual-perceptual (VMI-VP) additional test required each participant to identify the correct corresponding shape of each item in a series of 27 geometric shapes. This test was executed individually. It took three minutes to complete the test and the test was stopped after 3 minutes or after three consecutive mistakes were made. The motor coordination (VMI-MC) additional test required the copying of a geometric shape during which the participant must have drawn it as correctly as possible while remaining within the given lines. This test could be executed in a group or individually and the execution was stopped after 5 minutes had passed. The criteria for the allocation of points in the VMI-4 were as follows: A '0' was allocated for incorrect figures and a '1' for correct figures. The test was stopped when the time has elapsed or after three consecutive mistakes were made, except in the MC subtest, which was only stopped after the allocated time had elapsed. Data in this test were collected consecutively in three categories in the following order: VMI, visual perception and motor coordination. The raw scores were converted to standard scores and thereafter to percentile values. The standard scores were used to divide the participants into five different categories, ranging from very low (40-67), below average (68-82), average (83-117), above average (118-132) to very high (133-160) (Beery & Buktenica 1997). Academic school grading progress reports of the June mid-year assessments reflected the grading code of each of the six required learning areas of the particular participants in Grades 3 and 4 as well as the grade point average score of the six learning areas were obtained from each of the participating schools in 2013. The six compulsory learning areas were stipulated in the DoBE's South Africa Curriculum and Assessment Policy Statement (2014) and include the following learning areas: mathematics, home language, second language, natural sciences (NS), social sciences (SC) and life orientation (LO). Language learning in Grade 4 included all the official languages in South Africa, namely Afrikaans, English, isiNdebele, isiXhosa, isiZulu, Sepedi, Sesotho, Setswana, SiSwati, Tshivenda and Xitsonga. Home language referred to one or two languages offered at home language level (for the applicable school or district), while second language referred to a language which is not a mother tongue, but which is used for certain communicative functions in a society or in the classroom (CAPS 2014). National assessment guidelines for the Annual National Assessment (ANA), which is written in September of each year and which is compiled at a national level and written by all South African learners in maths and language skills as a requirement of the DoBE (DE 2016), required that learners had to be evaluated in the ANA assessment on knowledge that had to be assimilated during the first three quarters of the school year from January to December. These ANA results of each participant were also made available by the Department of Basic Education (2014) of the North West Province for each participating school. Academic performance in each learning area was coded into categories according to official grading codes in the CAPS which were then expressed as follows: A '7' is allocated for exceptional achievement (80% - 100%); a '6' for meritorious achievement (70% - 79%); a '5' for considerable achievement (60% - 69%); a '4' for sufficient achievement (50% - 59%); a '3' for average achievement (40% - 49%); a '2' for basic achievement (30% - 39%); and a '1' is allocated when the learning outcome was 'not achieved' (0% - 29%). The June mid-year assessments were compiled and scored by the applicable teachers where the ANA tests were compiled nationally by the DoBE but marked by the teachers therefore making it a more objective, representative and comparative assessment of learners' academic achievements. 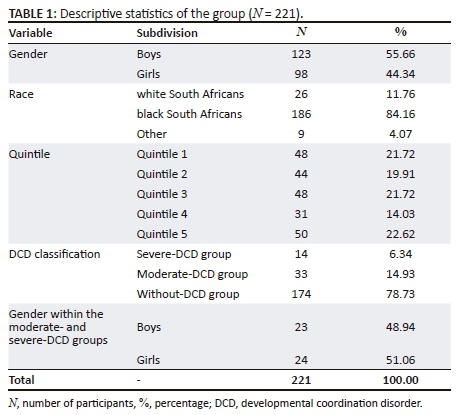 Table 3 reports descriptive values of the group as well as significant differences between the DCD group (< 16th percentile) and the without-DCD group as obtained in each of the outcome variables which included all the subsections of the VMI-4 and the MABC-2. The mean values in the DCD group were poorer in each of these subsections of both the VMI-4 and the MABC-2, compared to those in the without-DCD group. Statistical (p ≤ 0.05) and medium to large practical (d ≥ 0.8) significant differences are found for all the VMI-4 and MABC-2 variables. The visual perception mean standard score (79.17) of the DCD group is also categorised as below average (68-82), compared to the visual perception of the without-DCD group (84.57) that fell in the average category (83-117) (Beery & Buktenica 1997) which have clinical relevance. As these correlations indicated that the outcome variables are all related to academic performance in children with and without-DCD, a forward step-by-step regression analysis was performed to determine the unique percentage variance explained contribution (ΔR2) of best predictors for academic achievement in the group (Table 6). This analysis determined which of the three perceptual-motor constructs and the three motor coordination constructs had the biggest contribution to the variance that are explained in academic performance by these variables. The results obtained for the six compulsory learning areas and the grade point average of these six learning areas in the mid-year June school assessment as well as the National assessment (ANA), which only assess mathematics, home language and first additional language, are both displayed in Table 6. Visual perception explained the largest unique contribution of the total variance of all six perceptual-motor and coordination predictor variables in both regression analyses (Table 6) with the exception in Afrikaans (June) and English (ANA) where motor coordination showed a higher contribution to the total variance. Visual perception had the highest unique contribution to the total variance in all the other learning areas as well as in the grade point average. A total percentage variance of 18.17% was explained by these predictor variables in the grade point average where 16.36% was contributed by visual perception, while motor coordination (0.42%) and manual dexterity (0.95%) made additional small contributions. The ANA results, which were based on standardised papers drawn up nationally where teachers' subjective influence could hence not play a role, are also displayed in Table 6. The contribution of visual perception was even higher in two of the learning areas that were assessed. In Mathematics, visual perception explained 22.04% of the total percentage variance of 23.11%, while in Afrikaans visual perception contributed to 15.93% of the 23.65%. Manual dexterity and balance also proved to be contributors, although very small percentages of the total percentage variance were explained by these predictor variables. It appeared from these results that visual perception rather than visual-motor integration served as a significant contributor to academic achievement. Furthermore, our results established that visual perception was the largest unique contributor of all the different perceptual and coordination predictor variables that were analysed in explaining academic achievement in children, irrespective of motor difficulties (Table 6). Shin, Park and Park (2009:622) report a close interplay between 9- and 13-year-old children's visual skills (especially accommodation) and their academic achievement, and state that binocular dysfunction has a negative effect on reading, mathematics, science and social science (Shin et al. 2009). However, motor coordination or hand control served to a lesser degree as contributors, especially in language-related learning areas (Table 6). Motor coordination and manual dexterity might reflect on the fine muscle control abilities of the group, as well-functioning fine motor muscles and control can influence the quality of handwriting tasks and writing speed (Malloy-Miller et al. 1995; Schwellnus et al. 2012). Tseng and Chow (2000:87) also confirmed a significant relationship between VMI skills and writing skills. It was also interesting to note that motor coordination (especially hand skills as assessed in the VMI-4) had a significant and bigger role to play in especially language learning areas. It may be that some similarities in underlying processes are shared, as handwriting skills are considered to be an integral part of language-expressive skills. Inferior VMI, visual perception, motor coordination, manual dexterity, aiming-and-catching and balance were found in children with DCD which showed statistical, practical and even clinical relevance. Visual perception made a significant contribution to academic performance of Grade 4 learners, irrespective of whether children had coordination problems such as DCD. Visual perception also correlated highly with mathematical achievement in children with DCD as well as in children without-DCD and therefore seems to play a significant role in the child's ability to understand the perceptual concepts that are needed to execute mathematical tasks effectively at the age of 10 years. However, coordination problems as a predictor of academic performance in typical children did not increase this difficulty, while manual dexterity did not only show a higher association to academic performance in children with DCD compared to typical children, but also in comparison with visual perception. It is assumed that if a young child's motor skills are atomised, they will need less energy to concentrate on performing these skills, especially fine motor tasks during the early school years and can instead concentrate on the academic tasks at hand. Gross motor control and visual perception develops during early childhood and both should be well developed by 10 years. As motor proficiency and visual perception are both developmental processes, exposure to relevant learning environments are thus necessary and educators and policymakers should hence provide adequate resources and opportunities to improve development of these skills. Intervention strategies should also be in place for those children who are at risk for academic failure based on these developmental deficits. Children should therefore be exposed to stimulating environments from a very young age where age-appropriate development of perceptual-motor skills can establish a firm foundation for later academic skills and especially mathematical achievement. Activities that can contribute to the improvement of visual perception abilities and mathematical achievement may include obstacle courses (spatial orientation), different animal walks (motor planning) and activities that include different colours, shapes and dimensions. Sufficient training and empowerment of teachers in the development of these skills are also essential. Our results highlight that all children, irrespective of whether they have motor coordination problems, need to participate in such development programs at a young age. Visual-motor integration, visual perception, motor coordination, manual dexterity, aiming-and-catching and balance skills of children with motor difficulties such as DCD should also receive remedial attention from an early age. E.d.W. wrote this article as part of her master's degree under A.E.P. and D.C.'s supervision. Botha, P.N., 2013, 'A neurological, physiological and genetic orientation', in J.A. Kapp (ed. ), Children with problems: An orthopedagogical perspective, pp. 201-255, Van Schaik, Pretoria. Cheatum, B.A. & Hammond, A.A., 2000, Physical activities for improving children's learning and behavior: A guide to sensory motor development, Human Kinetics, Champaign, IL. South Africa, Department of Basic Education, 2014, 'Education statistics in South Africa 2013', North West, Department of Basic Education, Pretoria.